Thread: Udon Thani - Modern stilt house. Hi. So I've been living in Thailand for years and have a Thai partner of fifteen years and have decided to bite the bullet and build. I've been reading this forum as a guest for years too, and it's been really helpful for advice and encouragement. The land is old family now belonging to partner. It's situated in a tiny village on the country road to the famous Wat Kam Chanot near Ban Dung and about an hour north east of Udon Thani. The plot is about 3 rai, was overgrown with old mangos, palms and had an old block and tin roof house on it. Stunning corner position as you enter the village with unspoilt views of gently sloping away rice farms, pools and tall bamboo enclaves. The rice farms are all perfectly manicured as they are ceremonially used for the young princess. I have to have 5 posts so hold on for the pic or see avatar. It's from one of those Thai house magazines. Two bedrooms a large front balcony (covered) a balcony off the master bedroom which has an en suite, a further bathroom and a large open plan lounge and kitchen/diner. There is also a small rear balcony for washing machine etc. On concrete stilts 2m clearance. I really wanted it off the ground so that in the future I can build a guest suite and large western kitchen downstairs. Sounds very interesting. Go into the Games Room forum...that will get you five posts in minutes. Look forward to the thread. No-one from the village to work on it (including uncle who is a "builder" and has managed to cobble together most of the shacks around). a local builder with a track record of building houses that I could inspect and who had no relations or friends in the village. I'd be there at ground break and be nowhere around till it's nearly finished ( i know I just wouldn't be tolerant enough and I would upset everyone). A strict budget amounting to a sum I could lose completely without bankrupting me (should everything go horribly wrong). A written and detailed specification of materials (including actual product names), depth of post pits and septic waste etc. from the builder himself. Thanks Davis, I'll do that. More background. 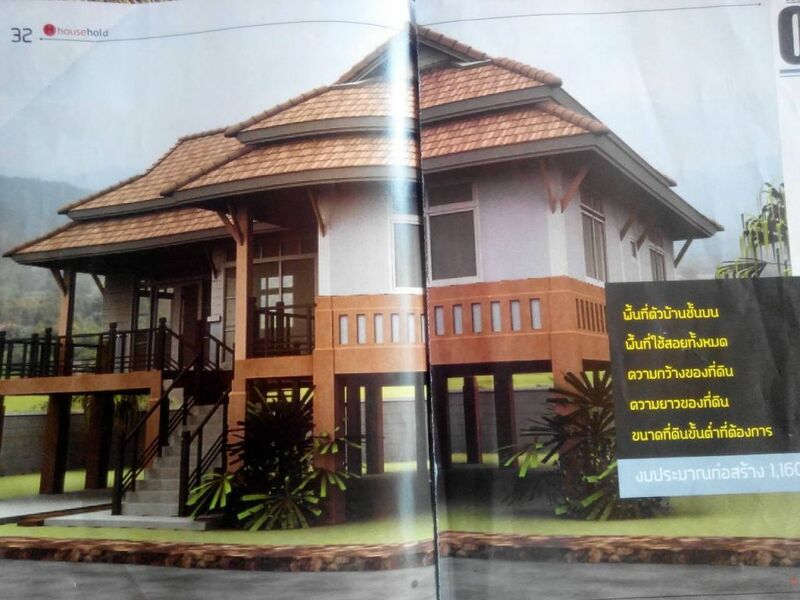 Tried a couple of those house building firms that advertise in Udon Thani. They were not good. I'm someone who couldn't put a shelf up but I have worked in construction admin, have managed my own houses refurbishments so I do know total BS when I hear it. You must have to pay a huge surcharge just to contribute to their massive overheads. Anyway both firms quoted ridiculous prices just by looking at the picture from the magazine. About 1,000,000 Bhts over my budget. And I'm not that keen on the thought of a Thai yuppy teenager with fluorescent teeth braces construction managing anything I intend to invest in. Next post can have some pics I hope! Wondering about who we could trust I remember from a few years ago a local electrician I used who completely re-wired the old house on this land. I gave him specific instructions that he mustn't have any taped joints and he was to install a German circuit breaker main board. He did all this - not a taped joint inside and a properly installed mains board. He did, however, splice into the mains outside and tape the joints (I hadn't mentioned not to do that). He was a nice, honest, reasonable and hard working guy though so we contact him and he gives the name of a builder a few villages away on the promise that he can do the electrics. Meet the builder, Mr Suang, at his house which is neat and tidy but ordinary - his wife has a little noodle restaurant out the front. He takes away the magazine to price up - comes back 2 days later with it all drawn out, a full spec and payment plan at a price of BHt 1,278,000. Push him down to BHT 1,200,000 - he agrees and we shake hands. Have the land cleared and leveled (too many high and lows) with 60 truck loads at 500 bht a load. Last edited by Nevo; 16-08-2015 at 04:31 AM. Have you got any bigger pics? I think that little boy was just helping for 10 mins for an ice cream. Not an illegal child slave before anyone asks. They ended up digging 24 x 2.5m deep post holes lined with re-inforced concrete. Can anyone help with how I make the pictures bigger? Just one thought for you .. if you are planning for extra rooms to fill in the 'stilted' area, then 2m clearance may not be enough to get any kind of false ceiling to hide any protruding drainage pipes from the floor above. Or to raise the floor level so nothing drains from outside into the space. I'd be happier with 2.5m or 3 m to underside of slab to allow for this. Looks good. What height will the house be off the ground? I would personally go for around 3 metres to allow flexibility in the future with lower level. With earth (ground) rod of course. Air con, oven and water pump if you have need separate circuit breakers as well. Fridge and freezer should be ok without. Suggest bringing power to the house via underground from source. Suggest use Panasonic power outlets and switches. Excellent quality. Sewage, plastc septic tank feeding a concrete tank. Separate concrete tank for grey water. Water supply: Depends on water quality and pressure. If water quality is poor bring through a filter into a holding tank then pumped into house. Water heater type depends on type of faucets you want. If faucets are mixer type suggest use a boiler/tank water heater. Or you can go with on demand heater as common in Thaland. In the sticks, getting sewage and water supply right pays off in the end. Approx how many square meters is the house? It's apparently 2.5m to the upstairs underside floor level when I've just asked so a bit less to supporting beams. That'll have to do as it's built already! All services and electrics come down hidden at vertical beam support level with access panels. The house is approx 450m2 ,Norton. Panasonic are booked for the sockets and circuit breakers and I'm pretty sure the septic was all done as you said. I don't reckon I'll be able to convince them to put the mains underground. House I lived in in Cambodia had a lightening conductor. Anyone have any thoughts about that? All services and electrics come down hidden at vertical beam support level with access panels. My comment was to bring power to the house from meter on utility pole under ground to the house then up. Costs a bit more but gets rid of power lines to the house. Looks you have your water sorted.